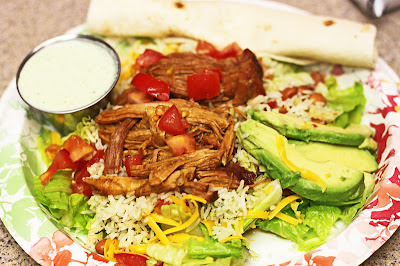 There are a lot of great Cafe Rio Pork Salad recipes floating around out there. 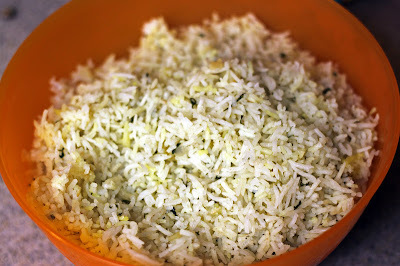 This is the recipe I've always used and I love it. The last couple of times I've been to Cafe Rio I've been so disappointed with my meal. It seems like they either skimp on the meat, it's been super fatty, or the flavor just seems off. Whatever the case may be, we sure enjoy making this meal at home! Remove chilies from the can of Adobo Sauce and discard chilies. Rinse can of adobo sauce with coke to get all the sauce out. Pour sauce and coke into a blender. 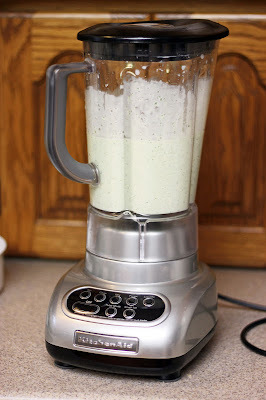 Add remaining ingredients (except pork) in the blender. Blend until well mixed. Place pork in crock pot and pour sauce over it. Cook in crock pot on low for 7-9 hours or until it pulls apart with a fork. Salad ingredients: Lettuce, tortillas, pork, pinto beans, rice, dressing, tomatoes, avocado, and cheese. Blend all together in blender. Let sit in refrigerator to thicken. Combine all ingredients and cook in a rice cooker. Add juice of 1/2 lime and mix well.